Thanksgiving is my favorite holiday. As a child, I remember the intoxicating smell of my dad’s homemade breads baking in the oven, scribbling out letters pleading my case to Santa and, of course, stuffing my face with every item in the cornucopia. As a young adult, I now take time to reflect and be thankful for how fortunate I am that I am coming home to more than just my loving family, but also to a table filled with delicious, nutritious foods. This year, consumers will be spending less on Thanksgiving and not because turkeys are cheaper. In fact, with the avian flu outbreak and high demand for this holiday bird, the price of the turkey has actually increased modestly. The reason for cheaper prices is primarily due to grocery stores wanting to get customers in the door. Grocers are willing to lower the price of the Thanksgiving star in order to do so. Despite Thanksgiving costing less this year and a culture glorifying food (“Chopped,” “Top Chef” and the bizarre compulsion to Instagram food, serving as examples, all of which I admit to be guilty of enjoying), the distribution of inequality in food security has continued to grow. In fact, roughly 17 percent of American households or about 50 million Americans, live in food-insecure households. 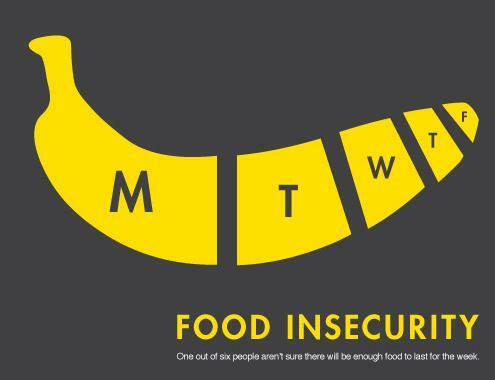 The United States Department of Agriculture (USDA) defines food security as, “Access by all people at all times to enough food for an active, healthy life.” Food insecurity is when families run out of food or do not have money to buy more food. Food insecurity and hunger is pervasive and exists in every county in America. Ironically, even those rural farm communities that provide food for the rest of the nation face food insecurity. Government programs such as the Supplemental Nutrition Assistance Program, or SNAP, (commonly referred to as food stamps) has done a lot to ensure that as income inequality has increased, caloric intake does not decrease. To this end, SNAP has been widely successful (see here and here). Although SNAP has been successful in providing supplemental food, it has not quite been as successful at providing quality nutrition. Solving hunger is a complex issue. Quality nutrition assumes that an individual is educated enough to make healthy food choices, has both money to afford and access to nutritious foods, has time to prepare fresh foods and has time to exercise. However, as SNAP worked to ensure that caloric requirements were being met, it has become common for those enrolled in food stamps to purchase unhealthy foods. Often this means the most vulnerable citizens are eating the lowest quality of food. With around 47 million Americans enrolled in SNAP, the average monthly allowance for food is $133 per month. This may seem like a decent amount. However, if one expects to eat breakfast, lunch and dinner every day, that is 84 meals in one month—a little over a $1.50 per meal. As a result, it is no surprise that higher calorie foods, which are cheaper yet less healthy, are the food of choice. Confounding the problem is the overall cost of food, which increased between 2004 and 2008. The cost of “healthy” foods increased by 29 percent while junk food grew by 16 percent, a significantly slower rate. It is no wonder British epidemiologist Kate Pickett noted one of the best predictors of a developed country’s obesity is its income inequality. It is well documented that highly processed foods are not healthy and that being overweight can cause a host of medical problems including diabetes and cardiovascular disease. Disturbingly, these are not the only health concerns. The World Health Organization recently released a study that indicated that processed meats are linked to cancer. However, the truth is despite food insecurity being a huge problem, the United States actually has an abundance of food! In fact, 40 percent of the food that is produced in the United States is not eaten. Yes, despite one in six Americans being unsure of where their next meal is coming from, we throw away approximately one-third of food produced in the U.S. The economic impacts of food waste are staggering. The U.S. spends approximately $130.5 billion in health care for hunger-linked medical issues. Additionally, we spend $750 million per year to throw away approximately $165 billion worth of food! On average, 20 pounds of food per person is tossed away each day. If we could somehow reduce food waste by a mere 15 percent, it would be possible to provide food to 25 million Americans. There must be a comprehensive strategy that addresses the complexities of income inequality, access to foods and food waste. Grocery stores and restaurants must be made aware that there are federal laws, such as The Good Samaritan Act, that protect them if they choose to donate food. Moreover, there must be tax incentives to help negate the costs of donating food to nonprofits, food pantries, etc. Most importantly, there must be infrastructure and coordination in place to assist in transporting, managing and ensuring food can be used in a timely manner. France is in the process of setting up an agency to oversee the prevention of food waste. While a new government agency may not be the answer in the U.S., perhaps local agencies, a collaborative board that oversees efforts between those corporations and small businesses that donate food, and the nonprofits that facilitate services may be a solution. Author: Laura Caccioppoli recently graduated from Villanova University with an MA in political science and a graduate certificate in nonprofit management. She currently works at University of the Sciences where she plans to continue her education in health policy. She is also a board member at The Consortium in Philadelphia. Her research interests are in health policy, cultural competency and social justice.